During World War II, Japan invaded and occupied Vietnam, a nation on the eastern edge of the Indochina Peninsula in Southeast Asia that had been under French administration since the late 19th century. Inspired by Chinese and Soviet communism, Ho Chi Minh formed the Viet Minh, or the League for the Independence of Vietnam, to fight both Japan and the French colonial administration. Japan withdrew its forces in 1945, leaving the French-educated Emperor Bao Dai in control of an independent Vietnam. Ho’s Viet Minh forces rose up immediately, seizing the northern city of Hanoi and declaring a Democratic Republic of Vietnam (DRV) with Ho as president. 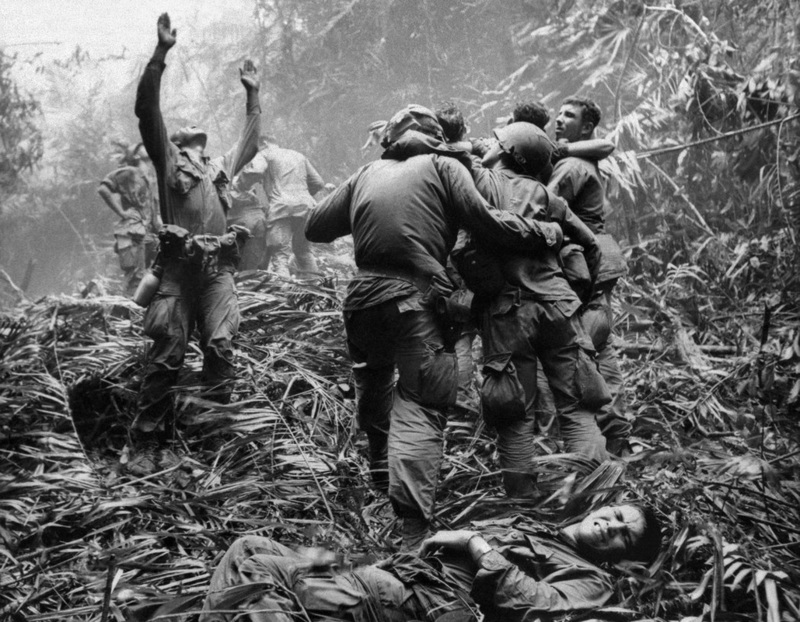 According to a survey by the Veterans Administration, some 500,000 of the 3 million troops who served in Vietnam suffered from post-traumatic stress disorder, and rates of divorce, suicide, alcoholism and drug addiction were markedly higher among veterans. Seeking to regain control of the region, France backed Bao and set up the state of Vietnam (South Vietnam) in July 1949, with Saigon as its capital. Armed conflict continued until a decisive battle at Dien Bien Phu in May 1954 ended in French defeat by Viet Minh forces. The subsequent treaty negotiations at Geneva split Vietnam along the latitude known as the 17th parallel (with Ho in control in the North and Bao in the South) and called for nationwide elections for reunification to be held in 1956. In 1955, however, the strongly anti-communist Ngo Dinh Diem pushed Bao aside to become president of the Government of the Republic of Vietnam (GVN). With the Cold War intensifying, the United States hardened its policies against any allies of the Soviet Union, and by 1955 President Dwight D. Eisenhower had pledged his firm support to Diem and South Vietnam. With training and equipment from American military and police, Diem’s security forces cracked down on Viet Minh sympathizers in the south, whom he derisively called Viet Cong (or Vietnamese Communist), arresting some 100,000 people, many of whom were tortured and executed. By 1957, the Viet Cong and other opponents of Diem’s repressive regime began fighting back with attacks on government officials and other targets, and by 1959 they had begun engaging South Vietnamese Army forces in firefights. In December 1960, Diem’s opponents within South Vietnam–both communist and non-communist–formed the National Liberation Front (NLF) to organize resistance to the regime. Though the NLF claimed to be autonomous and that most of its members were non-Communist, many in Washington assumed it was a puppet of Hanoi. A team sent by President John F. Kennedy in 1961 to report on conditions in South Vietnam advised a build-up of American military, economic and technical aid in order to help confront the Viet Cong threat. Working under the “domino theory,” which held that if one Southeast Asian country fell to communism, many would follow, Kennedy increased U.S. aid, though he stopped short of committing to a large-scale military intervention. By 1962, the U.S. military presence in South Vietnam had reached some 9,000 troops, compared with fewer than 800 during the 1950s. A coup by some of his own generals succeeded in toppling and killing Diem and his brother, Ngo Dinh Nhu, in November 1963, three weeks before Kennedy was assassinated in Dallas, Texas. The ensuing political instability in South Vietnam persuaded Kennedy’s successor, Lyndon B. Johnson, and Secretary of Defense Robert McNamara to further increase U.S. military and economic support. The following August, after DRV torpedo boats attacked two U.S. destroyers in the Gulf of Tonkin, Johnson ordered the retaliatory bombing of military targets in North Vietnam. Congress soon passed the Gulf of Tonkin Resolution, which gave Johnson broad war-making powers, and U.S. planes began regular bombing raids, codenamed Operation Rolling Thunder, the following February. In March 1965, Johnson made the decision–with solid support from the American public–to send U.S. combat forces into battle in Vietnam. By June, 82,000 combat troops were stationed in Vietnam, and General William Westmoreland was calling for 175,000 more by the end of 1965 to shore up the struggling South Vietnamese army. Despite the concerns of some of his advisers about this escalation, and about the entire war effort as well as a growing anti-war movement in the U.S., Johnson authorized the immediate dispatch of 100,000 troops at the end of July 1965 and another 100,000 in 1966. In addition to the United States, South Korea, Thailand, Australia and New Zealand also committed troops to fight in South Vietnam (albeit on a much smaller scale). In contrast to the air attacks on North Vietnam, the U.S.-South Vietnamese war effort in the south was fought on the ground, largely under the command of General Westmoreland, in coordination with the government of General Nguyen Van Thieu in Saigon. In general, U.S. military forces in the region pursued a policy of attrition, aiming to kill as many enemy troops as possible rather than trying to secure territory. By 1966, large areas of South Vietnam had been designated as “free-fire zones,” from which all innocent civilians were supposed to have evacuated and only enemy remained. 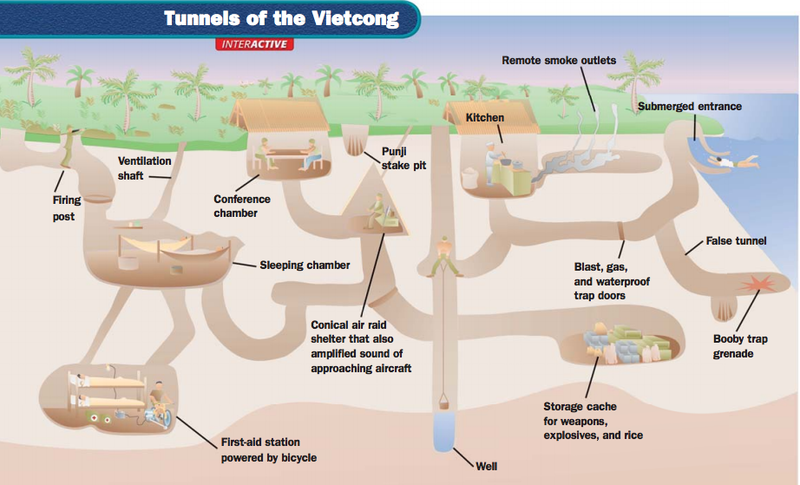 Heavy bombing by B-52 aircraft or shelling made these zones uninhabitable, as refugees poured into camps in designated safe areas near Saigon and other cities. Even as the body count (at times exaggerated by U.S. and South Vietnamese authorities) mounted steadily, DRV and Viet Cong troops refused to stop fighting, encouraged by the fact that they could easily reoccupy lost territory. Meanwhile, supported by aid from China and the Soviet Union, North Vietnam strengthened its air defenses. By November 1967, the number of American troops in Vietnam was approaching 500,000, and U.S. casualties had reached 15,058 killed and 109,527 wounded. As the war stretched on, some soldiers came to mistrust their government’s reasons for keeping them there, as well as Washington’s claims that the war was being won. The later years of the war saw increased physical and psychological deterioration among American soldiers, including drug use, mutinies and attacks by soldiers against officers and noncommissioned officers. Bombarded by horrific images of the war on their televisions, Americans on the home front turned against the war as well: In October 1967, some 35,000 demonstrators staged a mass antiwar protest outside the Pentagon. Opponents of the war argued that civilians, not enemy combatants, were the primary victims and that the United States was supporting a corrupt dictatorship in Saigon. By the end of 1967, Hanoi’s communist leadership was growing impatient as well, and sought to strike a decisive blow aimed at forcing the better-supplied United States to give up hopes of success. On January 31, 1968, some 70,000 DRV forces under General Vo Nguyen Giap launched the Tet offensive (named for the lunar new year), a coordinated series of fierce attacks on more than 100 cities and towns in South Vietnam. Though taken by surprise, U.S. and South Vietnamese forces managed to strike back quickly, and the communists were unable to hold any of the targets for more than a day or two. Reports of the attacks stunned the U.S. public, however, especially after news broke that Westmoreland had requested an additional 200,000 troops. With his approval ratings dropping in an election year, Johnson called a halt to bombing in much of North Vietnam in March (though bombings continued in the south) and promised to dedicate the rest of his term to seeking peace rather than reelection. Johnson’s new tack, laid out in a March 1968 speech, met with a positive response from Hanoi, and peace talks between the U.S. and North Vietnam opened in Paris that May. Despite the later inclusion of the South Vietnamese and the National Liberation Front (the political arm of the Viet Cong) the dialogue soon reached an impasse, and after an election campaign marred by violence, Republican Richard M. Nixon defeated Hubert Humphrey to win the White House. Nixon sought to deflate the antiwar movement by appealing to a “silent majority” of Americans who he believed supported the war effort. In an attempt to limit the volume of American casualties, he announced a program of withdrawing troops, increasing aerial and artillery bombardment and giving South Vietnamese control over ground operations. In addition to this policy, which he called “Vietnamization,” Nixon continued public peace talks in Paris, adding higher-level secret talks conducted by Secretary of State Henry Kissinger beginning in the spring of 1968. The North Vietnamese continued to insist on complete U.S. withdrawal as a condition of peace, however, and the next few years would bring even more carnage, including the horrifying revelation that U.S. soldiers had massacred more than 400 unarmed civilians in the village of My Lai in March 1968. Anti-war protests continued to build as the conflict wore on. In 1968 and 1969, there were hundreds of anti-war marches and gatherings throughout the country. On November 15, 1969, the largest anti-war protest in American history took place in Washington, D.C., as over 250,000 Americans gathered peacefully, calling for withdrawal of American troops from Vietnam. The anti-war movement, which was particularly strong on college campuses, divided Americans bitterly. For some young people, the war symbolized a form of unchecked authority they had come to resent. For other Americans, opposing the government was considered unpatriotic and treasonous. As the first U.S. troops were withdrawn, those who remained became increasingly angry and frustrated, exacerbating problems with morale and leadership. Tens of thousands of soldiers received dishonorable discharges for desertion, and about 500,000 American men from 1965-73 became “draft dodgers,” with many fleeing to Canada to evade conscription. Nixon ended draft calls in 1972, and instituted an all-volunteer army the following year. In 1970, a joint U.S-South Vietnamese operation invaded Cambodia, hoping to wipe out DRV supply bases there. The South Vietnamese then led their own invasion of Laos, which was pushed back by North Vietnam. The invasion of these countries, in violation of international law, sparked a new wave of protests on college campuses across America, including two at Kent State in Ohio and Jackson State in Mississippi during which National Guardsmen and police killed a total of six student protesters. By the end of June 1972, however, after another failed offensive into South Vietnam, Hanoi was finally willing to compromise. Kissinger and North Vietnamese representatives drafted a peace agreement by early fall, but leaders in Saigon rejected it, and in December Nixon authorized a number of bombing raids against targets in Hanoi and Haiphong. Known as the ChristmasBombings, the raids drew international condemnation. In January 1973, the United States and North Korea concluded a final peace agreement, ending open hostilities between the two nations. War between North and South Vietnam continued, however, until April 30, 1975, when DRV forces captured Saigon, renaming it Ho Chi Minh City (Ho himself died in 1969). The long conflict had affected an immense majority of the country’s population; in eight years of warfare, an estimated 2 million Vietnamese died, while 3 million were wounded and another 12 million became refugees. War had decimated the country’s infrastructure and economy, and reconstruction proceeded slowly. In 1976, Vietnam was unified as the Socialist Republic of Vietnam, though sporadic violence continued over the next 15 years, including conflicts with neighboring China and Cambodia. Under a broad free market policy put in place in 1986, the economy began to improve, boosted by oil export revenues and an influx of foreign capital. Trade and diplomatic relations between Vietnam and the U.S. were resumed in the 1990s. In the United States, the effects of the Vietnam War would linger long after the last troops returned home in 1973. The nation spent more than $120 billion on the conflict in Vietnam from 1965-73; this massive spending led to widespread inflation, exacerbated by a worldwide oil crisis in 1973 and skyrocketing fuel prices. Psychologically, the effects ran even deeper. The war had pierced the myth of American invincibility, and had bitterly divided the nation. Many returning veterans faced negative reactions from both opponents of the war (who viewed them as having killed innocent civilians) and its supporters (who saw them as having lost the war), along with physical damage including the effects of exposure to the harmful chemical herbicide Agent Orange, millions of gallons of which had been dumped by U.S. planes on the dense forests of Vietnam. In 1982, the Vietnam Veterans Memorial was unveiled in Washington, D.C. On it were inscribed the names of 57,939 American armed forces killed or missing during the war; later additions brought that total to 58,200.